Closest to me are my friends and family. Equally as important though is my business, and the team here that keeps it fun and successful. 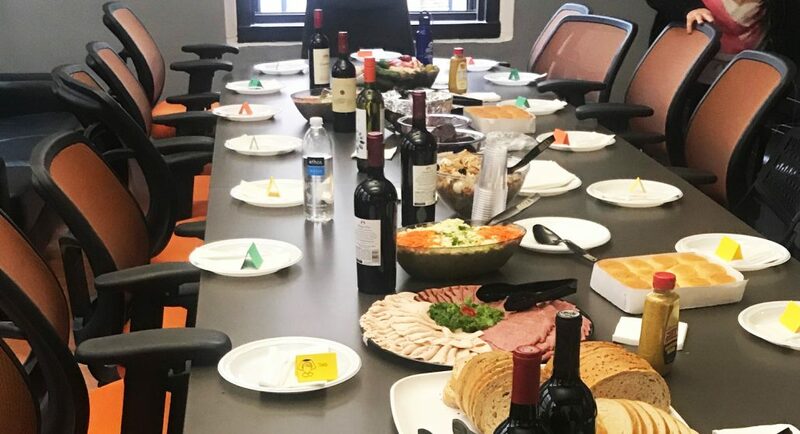 Last week we held a “Friendsgiving Dinner.” Let’s just say, I’m sure everyone in the room wouldn’t mind if it became a monthly tradition. Besides the homemade dishes, rows of crockpots, a dessert table, and (many) bottles of wine, there was an overwhelming feeling of happiness and togetherness. When I was pushed to make remarks (I should know by now this is going to happen and perhaps prepare something in advance next time) I said how lucky we are, or, dare I say, I was, to be at a place where people want to be in a room together, share a meal, and, more importantly, share a laugh. I know we’re not the only company that shares these values. One only needs to look at a “Best Places to Work” list and, alongside benefits and office atmosphere, is high company morale and team building activities. But, for every agency that takes the time to instill these values, I’m sure there are plenty that don’t. I know it’s hard sometimes to find time to step away from the day-to-day and do things that matter. In a perfect world, we would have that Friendsgiving meal here every month. But all of us lead busy lives, and our roster of clients and projects keep us pretty busy here as well. So maybe it’s not a lunch with co-workers. Maybe it’s a walk with a friend, a good deed, or even a monetary donation. Wouldn’t it be great if everyone made an effort to do just one extra nice thing this holiday season? Can you imagine that? This year our holiday gifts will once again have a pro-social element tied to them, we’re already planning next years “MAGVolunteers,” and when the office manager announced that we received this year’s Winter Wishes from NY Cares, I’m proud to say within minutes they were all snatched up. It’s not nearly enough, but it’s a start, a step in the right direction. I’m looking forward to so many things in the year to come – health and happiness, an even stronger year for the group, and other ways to do our part in making the world a better place.